It’s me. Long time no see. I’m truly sorry about that. These donuts are my way of saying I’m sorry I was gone for so long. Donuts and coffee make everything better. Donuts are good at saying I’m sorry. Or have a great day. Donuts work in just about any situation. If it’s your anniversary you may want to go with something a little fancier, just sayin’. 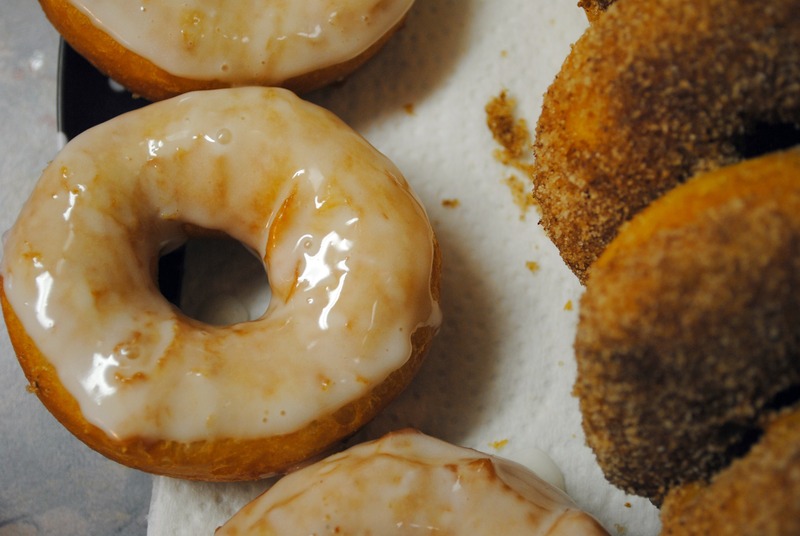 Let’s talk about these donuts. You know what’s so great about these donuts? They require no mixing, no blending, no sifting, and no waiting for that pesky yeast to rise. See these are fake out donuts. They started their lives as canned biscuits. GASP! Now I’m not really a huge fan of canned biscuits baked to eat straight out the the can. No see I’m a southern girl and I spent enough time at the elbow of my Great-Grand Mama and my Mama to appreciate a real deal buttermilk biscuit. 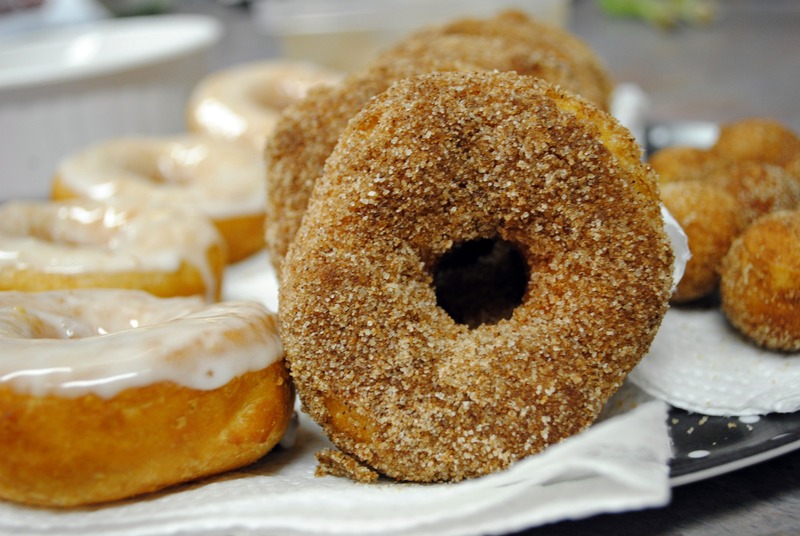 But canned biscuits transformed into donuts….I can get on board with that. Plus they area easy peasy and your family will love them! Pour about two inches vegetable oil into the pan and place it on med-high heat. Allow the oil to get good and hot. While your oil is warming remove the biscuits from the container and place on the counter or a cutting board. Use a small round cookie cutter to cut out the hole in the center. (I actually used the back end of a large icing tip) Save the centers for donut holes. Once your oil is nice and warm drop in one of your donut holes to test it. It should turn a light golden brown. Use your tongs to roll it so it’s evenly browned. Once evenly browned remove to a plate lined with paper towels. To cook the donuts drop them into the grease one at a time. My pan would hold about 4 donuts per batch. You don’t want them to be crowded. Once the donuts are a light golden brown flip them with your tongs. Remove to paper lined plate once browned on both sides. 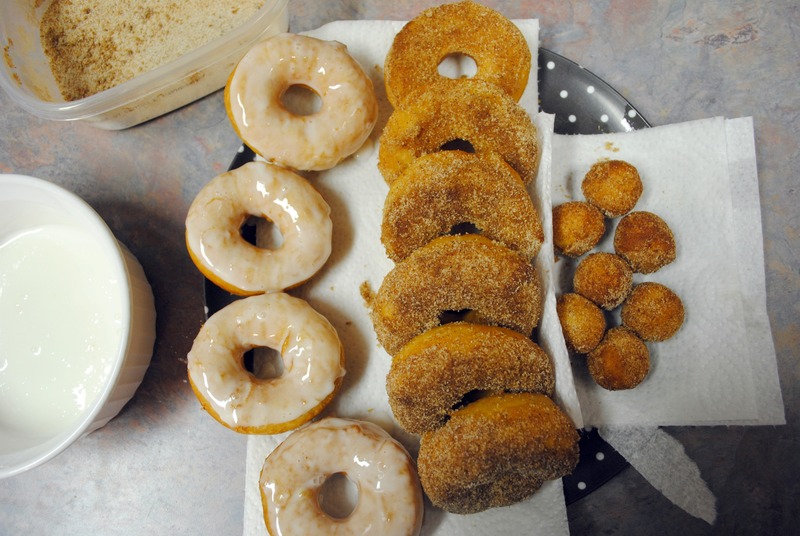 After you’ve cooked all of your donuts and holes you can top them how ever you like. I used a bit of powdered sugar mixed with milk for some of mine. For the others I brushed the tops lightly with some melted butter and dipped them into a cinnamon sugar mixture. I think these would also be delicious dusted with powdered sugar or topped with chocolate ganache. Hola, nice comeback post – those doughnuts look SO yummy!